Failure to yield right-of-way before a blinking red signal can result in strict fines and penalties. Motor vehicle drivers must obey traffic signals, signs, and pavement markings. For example, you must come to a complete stop when you see a blinking red light and follow the right-of-way laws. White pavement lines show you where to stop. In general, traffic laws mandate to stop before any white crosswalk line on the pavement. Failure to stop before the intersection or a blinking red signal is considered a violation of traffic rules and you may receive a citation or face fines and penalties for such a violation. The fines and penalties could be stricter for school bus drivers. 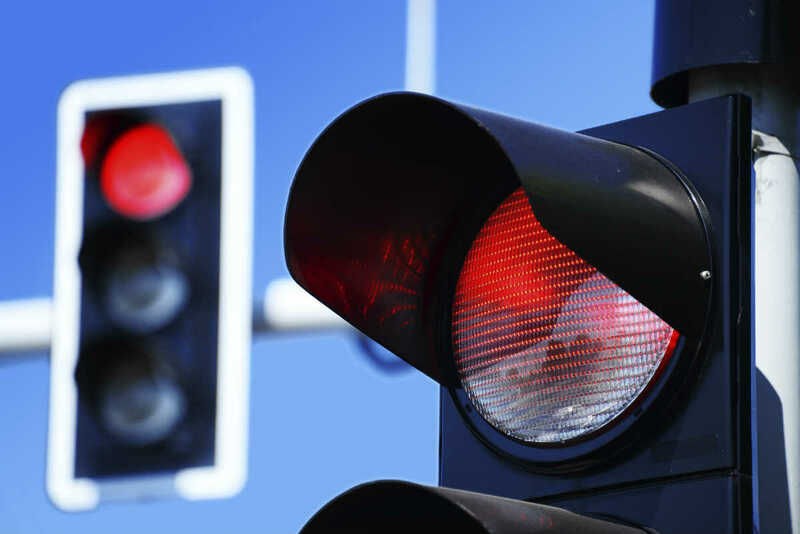 Different states have different laws regarding failure to stop at a blinking red light. Most states impose a fine or penalty of $100 or higher on a negligent driver. The same moving violation in school zones or construction areas may result in double fines. There could be stricter penalties for failure to stop before a blinking red light near a bus stop. If your failure to stop causes an accident, you may be charged with higher fines and penalties. When you violate a traffic rule, two points may be added to your driver’s license record. Avoid exceeding the state’s maximum limit for points or you may face suspension of your driver’s license or even worse total cancellation of it. Furthermore, if you have higher points on your driver’s license record, you may need to pay higher insurance premiums. A flashing red light indicates to stop before the marked stop line. In the absence of a stop line, a driver must stop before the marked crosswalk on the intersection. If there is no marked crosswalk, then the driver must stop as close to the intersection as possible but should not cross the intersection and position the vehicle in such a way to view ongoing traffic on the intersecting roadway before entering. Ensure that your rights are protected if you have been involved in an automobile accident. For legal help, consult with a St. Louis auto accident attorney at The Hoffmann Law Firm, L.L.C.